Functional dyspepsia (FD) is a common but under-recognized syndrome comprising bothersome recurrent postprandial fullness, early satiety, or epigastric pain/burning. Epidemiologically, there are two clinically distinct FD syndromes (although these often overlap clinically): postprandial distress syndrome (PDS; comprising early satiety or meal-related fullness) and epigastric pain syndrome. Symptoms of gastroesophageal reflux disease overlap with FD more than expected by chance; a subset has pathological acid reflux. The pre-test probability of FD in a patient who presents with classical FD symptoms and no alarm features is high, approximately 0.7. Coexistent heartburn should not lead to the exclusion of FD as a diagnosis. One of the most exciting observations in FD has been the consistent finding of increased duodenal eosinophilia, notably in PDS. Small bowel homing T cells, signaling intestinal inflammation, and increased cytokines have been detected in the circulation, and elevated tumor necrosis factor-α levels have been significantly correlated with increased anxiety. Postinfectious gastroenteritis is a risk factor for FD. Therapeutic options remain limited and provide only symptomatic benefit in most cases. Only one therapy is known to change the natural history of FD–Helicobacter pylori eradication. Treatment of duodenal eosinophilia is under investigation. Functional gastrointestinal disorders (FGIDs) are common unexplained gastrointestinal (GI) symptom complexes that are thought to arise from different regions of the GI tract, and the two most recognized disorders are functional dyspepsia (FD) and the irritable bowel syndrome (IBS). FD is a clinical syndrome comprising chronic symptoms arising from the gastroduodenal region.1 According to the Rome criteria, based on expert consensus, the prototypical symptoms are bothersome recurrent postprandial fullness, inability to finish a normal sized meal (early satiety), epigastric pain or epigastric burning in the setting of a normal upper endoscopy.2 However, many patients with FD also experience other troublesome symptoms including nausea, bloating, belching, and heartburn. Symptoms of GERD overlap with FD as otherwise defined by Rome III more than expected by chance; a subset of these overlap cases have pathological acid reflux.28 Recent data suggest gastric disaccommodation increases the number of transient lower esophageal relaxations.29 As a subset with FD (up to 40%) also have a failure of gastric accommodation, this may account for the overlap of FD with GERD, and further suggests the strict exclusion of all heartburn from the definition of FD introduces substantial selection bias. One of the most exciting observations in FD has been the consistent finding of duodenal eosinophilia in many cases with PDS around the world, following the first report in adults by Talley et al.8,52–55 The normal cutoff may vary geographically but more than 22 eosinophils in 5 high power fields is generally considered abnormal; otherwise biopsies look normal and the eosinophilia will not usually be detected unless counting is performed (Fig. 1). In Belgium, elegant experimental work has confirmed duodenal eosinophilia and also observed increased duodenal mast cells.56 Notably the patient cohort in nine of the 15 cases had overlapping FD and IBS which may account for the increased mast cells, as Walker et al.56 found duodenal mast cells were characteristic of IBS but not pure (nonoverlapping) FD. Prokinetic therapy overall is superior to placebo based on meta-analysis data of randomized controlled trials but the results are largely driven by cisapride that has limited to no availability and was withdrawn because of concern over QT prolongation and the risk of sudden death.79 Cisapride, a 5HT4 agonist does relax the gastric fundus plus it has 5HT3 antagonist actions that may improve nausea. FD is a common disorder; up to 40% appear to have structural alterations in the duodenum including increased duodenal permeability, duodenal eosinophilia and neural alterations, suggesting the term functional is a misnomer. GERD and FD may in some cases share a similar pathogenesis and separating GERD from FD is largely artificial. FD symptoms impair quality of life and treatment is indicated if simple measures such as reassurance and dietary restrictions fail. Medical therapy remains largely symptom driven although in patients with H. pylori infection there is the hope of symptom cure in a small minority with eradication therapy. The observation of duodenal eosinophilia in a substantial proportion with FD has opened up new diagnostic and therapeutic possibilities. Dr Talley is funded by the National Health and Medical Reearch Council of Australia. He has received grant support from Commonwealth Diagnostic Laboratories, Prometheus, GI Therapies, Janssen, Abbott, Pfizer and Salix, and consulted for Allergan, Yuhan, Adelphi Values and GI Therapies. Fig. 1. 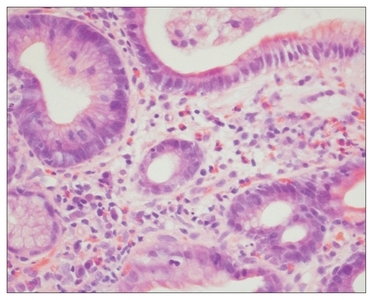 Increased duodenal eosinophils in a patient with functional dyspepsia (H&E, ×40) (with permission from Walker MM and Talley NJ, 2016). Talley, NJ, and Ford, AC (2015). Functional dyspepsia. N Engl J Med. 373, 1853-1863. Camilleri, M, Dubois, D, and Coulie, B (2005). Prevalence and socioeconomic impact of upper gastrointestinal disorders in the United States: results of the US Upper Gastrointestinal Study. Clin Gastroenterol Hepatol. 3, 543-552. Ford, AC, Marwaha, A, Sood, R, and Moayyedi, P (2015). Global prevalence of, and risk factors for, uninvestigated dyspepsia: a meta-analysis. Gut. 64, 1049-1057. Ford, AC, Marwaha, A, Lim, A, and Moayyedi, P (2010). What is the prevalence of clinically significant endoscopic findings in subjects with dyspepsia? Systematic review and meta-analysis. Clin Gastroenterol Hepatol. 8, 830-837.e2. Pleyer, C, Bittner, H, and Locke, GR (2014). Overdiagnosis of gastro-esophageal reflux disease and underdiagnosis of functional dyspepsia in a USA community. Neurogastroenterol Motil. 26, 1163-1171. Jones, MP, Walker, MM, Ford, AC, and Talley, NJ (2014). The overlap of atopy and functional gastrointestinal disorders among 23,471 patients in primary care. Aliment Pharmacol Ther. 40, 382-391. Talley, NJ, Walker, MM, and Aro, P (2007). Non-ulcer dyspepsia and duodenal eosinophilia: an adult endoscopic population-based case-control study. Clin Gastroenterol Hepatol. 5, 1175-1183. Ford, AC, Talley, NJ, Walker, MM, and Jones, MP (2014). Increased prevalence of autoimmune diseases in functional gastrointestinal disorders: case-control study of 23471 primary care patients. Aliment Pharmacol Ther. 40, 827-834. Aro, P, Talley, NJ, and Agréus, L (2011). Functional dyspepsia impairs quality of life in the adult population. Aliment Pharmacol Ther. 33, 1215-1224. Haag, S, Senf, W, and Häuser, W (2008). Impairment of health-related quality of life in functional dyspepsia and chronic liver disease: the influence of depression and anxiety. Aliment Pharmacol Ther. 27, 561-571. Lacy, BE, Weiser, KT, Kennedy, AT, Crowell, MD, and Talley, NJ (2013). Functional dyspepsia: the economic impact to patients. Aliment Pharmacol Ther. 38, 170-177. Brook, RA, Kleinman, NL, Choung, RS, Melkonian, AK, Smeeding, JE, and Talley, NJ (2010). Functional dyspepsia impacts absenteeism and direct and indirect costs. Clin Gastroenterol Hepatol. 8, 498-503. Brook, RA, Kleinman, NL, Choung, RS, Smeeding, JE, and Talley, NJ (2012). Excess comorbidity prevalence and cost associated with functional dyspepsia in an employed population. Dig Dis Sci. 57, 109-118. Chang, JY, Locke, GR, and McNally, MA (2010). Impact of functional gastrointestinal disorders on survival in the community. Am J Gastroenterol. 105, 822-832. Moayyedi, P, Talley, NJ, Fennerty, MB, and Vakil, N (2006). Can the clinical history distinguish between organic and functional dyspepsia?. JAMA. 295, 1566-1576. Ford, AC, Bercik, P, Morgan, DG, Bolino, C, Pintos-Sanchez, MI, and Moayyedi, P (2014). The Rome III criteria for the diagnosis of functional dyspepsia in secondary care are not superior to previous definitions. Gastroenterology. 146, 932-940. Vakil, N, Halling, K, Ohlsson, L, and Wernersson, B (2013). Symptom overlap between postprandial distress and epigastric pain syndromes of the Rome III dyspepsia classification. Am J Gastroenterol. 108, 767-774. Tack, J, and Talley, NJ (2013). Functional dyspepsia: symptoms, definitions and validity of the Rome III criteria. Nat Rev Gastroenterol Hepatol. 10, 134-141. Bisschops, R, Karamanolis, G, and Arts, J (2008). Relationship between symptoms and ingestion of a meal in functional dyspepsia. Gut. 57, 1495-1503. Gururatsakul, M, Holloway, RH, Bellon, M, Bartholomeusz, D, Talley, NJ, and Holtmann, GJ (2014). Complicated and uncomplicated peptic ulcer disease: altered symptom response to a nutrient challenge linked to gastric motor dysfunction. Digestion. 89, 239-246. Gururatsakul, M, Holloway, RH, Adam, B, Liebregts, T, Talley, NJ, and Holtmann, GJ (2010). The ageing gut: diminished symptom response to a standardized nutrient stimulus. Neurogastroenterol Motil. 22, 246-e77. Keshteli, AH, Feizi, A, and Esmaillzadeh, A (2015). Patterns of dietary behaviours identified by latent class analysis are associated with chronic uninvestigated dyspepsia. Br J Nutr. 113, 803-812. Jones, MP, Talley, NJ, Eslick, GD, Dubois, D, and Tack, J (2008). Community subgroups in dyspepsia and their association with weight loss. Am J Gastroenterol. 103, 2051-2060. Talley, NJ, Locke, GR, and Lahr, BD (2006). Functional dyspepsia, delayed gastric emptying, and impaired quality of life. Gut. 55, 933-939. Stanghellini, V, and Tack, J (2014). Gastroparesis: separate entity or just a part of dyspepsia?. Gut. 63, 1972-1978. Jung, HK, Choung, RS, and Locke, GR (2009). The incidence, prevalence, and outcomes of patients with gastroparesis in Olmsted County, Minnesota, from 1996 to 2006. Gastroenterology. 136, 1225-1233. Savarino, E, Pohl, D, and Zentilin, P (2009). Functional heartburn has more in common with functional dyspepsia than with non-erosive reflux disease. Gut. 58, 1185-1191. Pauwels, A, Altan, E, and Tack, J (2014). The gastric accommodation response to meal intake determines the occurrence of transient lower esophageal sphincter relaxations and reflux events in patients with gastroesophageal reflux disease. Neurogastroenterol Motil. 26, 581-588. Choung, RS, Locke, GR, Lee, RM, Schleck, CD, Zinsmeister, AR, and Talley, NJ (2012). Cyclic vomiting syndrome and functional vomiting in adults: association with cannabinoid use in males. Neurogastroenterol Motil. 24, 20-e1. Choung, RS, Locke, GR, Schleck, CD, Zinsmeister, AR, and Talley, NJ (2013). Associations between medication use and functional gastrointestinal disorders: a population-based study. Neurogastroenterol Motil. 25, 413-e298. Choung, RS, Locke, GR, Zinsmeister, AR, Schleck, CD, and Talley, NJ (2009). Opioid bowel dysfunction and narcotic bowel syndrome: a population-based study. Am J Gastroenterol. 104, 1199-1204. Gathaiya, N, Locke, GR, Camilleri, M, Schleck, CD, Zinsmeister, AR, and Talley, NJ (2009). Novel associations with dyspepsia: a community-based study of familial aggregation, sleep dysfunction and somatization. Neurogastroenterol Motil. 21, 922-e69. Holtmann, G, Siffert, W, and Haag, S (2004). G-protein beta 3 subunit 825 CC genotype is associated with unexplained (functional) dyspepsia. Gastroenterology. 126, 971-979. Shimpuku, M, Futagami, S, and Kawagoe, T (2011). G-protein beta3 subunit 825CC genotype is associated with postprandial distress syndrome with impaired gastric emptying and with the feeling of hunger in Japanese. Neurogastroenterol Motil. 23, 1073-1080. Singh, R, Mittal, B, and Ghoshal, UC (2016). Functional dyspepsia is associated with GNbeta3 C825T and CCK-AR T/C polymorphism. Eur J Gastroenterol Hepatol. 28, 226-232. Kourikou, A, Karamanolis, GP, Dimitriadis, GD, and Triantafyllou, K (2015). Gene polymorphisms associated with functional dyspepsia. World J Gastroenterol. 21, 7672-7682. Aro, P, Talley, NJ, Johansson, SE, Agréus, L, and Ronkainen, J (2015). Anxiety is linked to new-onset dyspepsia in the Swedish population: a 10-year follow-up study. Gastroenterology. 148, 928-937. Koloski, NA, Jones, M, Kalantar, J, Weltman, M, Zaguirre, J, and Talley, NJ (2012). The brain–gut pathway in functional gastrointestinal disorders is bidirectional: a 12-year prospective population-based study. Gut. 61, 1284-1290. Gracie, DJ, Bercik, P, and Morgan, DG (2015). No increase in prevalence of somatization in functional vs organic dyspepsia: a cross-sectional survey. Neurogastroenterol Motil. 27, 1024-1031. Koloski, NA, Talley, NJ, and Boyce, PM (2005). A history of abuse in community subjects with irritable bowel syndrome and functional dyspepsia: the role of other psychosocial variables. Digestion. 72, 86-96. Haag, S, Talley, NJ, and Holtmann, G (2004). Symptom patterns in functional dyspepsia and irritable bowel syndrome: relationship to disturbances in gastric emptying and response to a nutrient challenge in consulters and non-consulters. Gut. 53, 1445-1451. Haag, S, Senf, W, and Tagay, S (2010). Is there any association between disturbed gastrointestinal visceromotor and sensory function and impaired quality of life in functional dyspepsia?. Neurogastroenterol Motil. 22, 262-e79. Van Oudenhove, L, Vandenberghe, J, and Geeraerts, B (2008). Determinants of symptoms in functional dyspepsia: gastric senso-rimotor function, psychosocial factors or somatisation?. Gut. 57, 1666-1673. Ly, HG, Weltens, N, Tack, J, and Van Oudenhove, L (2015). Acute anxiety and anxiety disorders are associated with impaired gastric accommodation in patients with functional dyspepsia. Clin Gastroenterol Hepatol. 13, 1584-1591.e3. di Stefano, M, Vos, R, Vanuytsel, T, Janssens, J, and Tack, J (2009). Prolonged duodenal acid perfusion and dyspeptic symptom occurrence in healthy volunteers. Neurogastroenterol Motil. 21, 712-e40. Vanuytsel, T, Karamanolis, G, Vos, R, Van Oudenhove, L, Farré, R, and Tack, J (2013). Role of duodenal mucosal nerve endings in the acid-induced duodenogastric sensorimotor reflex: effect of benzocaine in healthy humans. Neurogastroenterol Motil. 25, e353-e361. Kazemi, M, Eshraghian, A, Hamidpour, L, and Taghavi, S (2015). Changes in serum ghrelin level in relation to meal-time in patients with functional dyspepsia. United European Gastroenterol J. 3, 11-16. Pilichiewicz, AN, Feltrin, KL, and Horowitz, M (2008). Functional dyspepsia is associated with a greater symptomatic response to fat but not carbohydrate, increased fasting and postprandial CCK, and diminished PYY. Am J Gastroenterol. 103, 2613-2623.
van Boxel, OS, ter Linde, JJ, Oors, J, and Otto, B (2014). Functional dyspepsia patients have lower mucosal cholecystokinin concentrations in response to duodenal lipid. Eur J Gastroenterol Hepatol. 26, 205-212. Bharucha, AE, Camilleri, M, and Burton, DD (2014). Increased nutrient sensitivity and plasma concentrations of enteral hormones during duodenal nutrient infusion in functional dyspepsia. Am J Gastroenterol. 109, 1910-1920. Friesen, CA, Schurman, JV, Colombo, JM, and Abdel-Rahman, SM (2013). Eosinophils and mast cells as therapeutic targets in pediatric functional dyspepsia. World J Gastrointest Pharmacol Ther. 4, 86-96. Walker, MM, Aggarwal, KR, and Shim, LS (2014). Duodenal eosinophilia and early satiety in functional dyspepsia: confirmation of a positive association in an Australian cohort. J Gastroenterol Hepatol. 29, 474-479. Nwokediuko, SC, Ijoma, UN, Obienu, O, Anigbo, GE, and Okafor, O (2013). High degree of duodenal inflammation in Nigerians with functional dyspepsia. Clin Exp Gastroenterol. 7, 7-12. Walker, MM, Salehian, SS, and Murray, CE (2010). Implications of eosinophilia in the normal duodenal biopsy: an association with allergy and functional dyspepsia. Aliment Pharmacol Ther. 31, 1229-1236. Walker, MM, Talley, NJ, and Prabhakar, M (2009). Duodenal mastocytosis, eosinophilia and intraepithelial lymphocytosis as possible disease markers in the irritable bowel syndrome and functional dyspepsia. Aliment Pharmacol Ther. 29, 765-773. Vanheel, H, Vicario, M, and Vanuytsel, T (2014). Impaired duodenal mucosal integrity and low-grade inflammation in functional dyspepsia. Gut. 63, 262-271. Cirillo, C, Bessissow, T, Desmet, AS, Vanheel, H, Tack, J, and Vanden Berghe, P (2015). Evidence for neuronal and structural changes in sub-mucous ganglia of patients with functional dyspepsia. Am J Gastroenterol. 110, 1205-1215. Esmaillzadeh, A, Keshteli, AH, Tabesh, M, Feizi, A, and Adibi, P (2014). Smoking status and prevalence of upper gastrointestinal disorders. Digestion. 89, 282-290. Liebregts, T, Adam, B, and Bredack, C (2011). Small bowel homing T cells are associated with symptoms and delayed gastric emptying in functional dyspepsia. Am J Gastroenterol. 106, 1089-1098. Keely, S, Walker, MM, Marks, E, and Talley, NJ (2015). Immune dysregulation in the functional gastrointestinal disorders. Eur J Clin Invest. 45, 1350-1359. Koloski, NA, Jones, M, and Weltman, M (2015). Identification of early environmental risk factors for irritable bowel syndrome and dyspepsia. Neurogastroenterol Motil. 27, 1317-1325. Boettcher, E, and Crowe, SE (2013). Dietary proteins and functional gastrointestinal disorders. Am J Gastroenterol. 108, 728-736. Paula, H, Grover, M, and Halder, SL (2015). Non-enteric infections, antibiotic use, and risk of development of functional gastrointestinal disorders. Neurogastroenterol Motil. 27, 1580-1586. Walker, MM, and Talley, NJ (2014). Review article: bacteria and pathogenesis of disease in the upper gastrointestinal tract: beyond the era of Helicobacter pylori. Aliment Pharmacol Ther. 39, 767-779. Futagami, S, Itoh, T, and Sakamoto, C (2015). Systematic review with meta-analysis: post-infectious functional dyspepsia. Aliment Pharmacol Ther. 41, 177-188. Tuteja, AK, Talley, NJ, and Gelman, SS (2008). Development of functional diarrhea, constipation, irritable bowel syndrome, and dyspepsia during and after traveling outside the USA. Dig Dis Sci. 53, 271-276. Futagami, S, Shindo, T, and Kawagoe, T (2010). Migration of eosinophils and CCR2-/CD68-double positive cells into the duodenal mucosa of patients with postinfectious functional dyspepsia. Am J Gastroenterol. 105, 1835-1842. Tack, J, Demedts, I, and Dehondt, G (2002). Clinical and pathophysiological characteristics of acute-onset functional dyspepsia. Gastroenterology. 122, 1738-1747. Dizdar, V, Spiller, R, and Singh, G (2010). Relative importance of abnormalities of CCK and 5-HT (serotonin) in Giardia-induced post-infectious irritable bowel syndrome and functional dyspepsia. Aliment Pharmacol Ther. 31, 883-891. Spiller, R (2010). Postinfectious functional dyspepsia and postinfectious irritable bowel syndrome: different symptoms but similar risk factors. Gastroenterology. 138, 1660-1663. Talley, NJ, Locke, GR, and Lahr, BD (2006). Predictors of the placebo response in functional dyspepsia. Aliment Pharmacol Ther. 23, 923-936. Pilichiewicz, AN, Horowitz, M, Holtmann, GJ, Talley, NJ, and Feinle-Bisset, C (2009). Relationship between symptoms and dietary patterns in patients with functional dyspepsia. Clin Gastroenterol Hepatol. 7, 317-322. Zala, AV, Walker, MM, and Talley, NJ (2015). Emerging drugs for functional dyspepsia. Expert Opin Emerg Drugs. 20, 221-233. Moshiree, B, Barboza, J, and Talley, N (2013). An update on current pharmacotherapy options for dyspepsia. Expert Opin Pharmacother. 14, 1737-1753. Lacy, BE, Talley, NJ, and Locke, GR (2012). Review article: current treatment options and management of functional dyspepsia. Aliment Pharmacol Ther. 36, 3-15. Yazdanbod, A, Salimian, S, Habibzadeh, S, Hooshyar, A, Maleki, N, and Norouzvand, M (2015). Effect of Helicobacter pylori eradication in Iranian patients with functional dyspepsia: a prospective, randomized, placebo-controlled trial. Arch Med Sci. 11, 964-969. Mazzoleni, LE, Sander, GB, and Francesconi, CF (2011). Helicobacter pylori eradication in functional dyspepsia: HEROES trial. Arch Intern Med. 171, 1929-1936. Holtmann, G, and Talley, NJ (2015). Functional dyspepsia. Curr Opin Gastroenterol. 31, 492-498. Moayyedi, P, Delaney, BC, Vakil, N, Forman, D, and Talley, NJ (2004). The efficacy of proton pump inhibitors in nonulcer dyspepsia: a systematic review and economic analysis. Gastroenterology. 127, 1329-1337. Talley, NJ, Vakil, N, and Lauritsen, K (2007). Randomized-controlled trial of esomeprazole in functional dyspepsia patients with epigastric pain or burning: does a 1-week trial of acid suppression predict symptom response?. Aliment Pharmacol Ther. 26, 673-682. Friesen, CA, Sandridge, L, Andre, L, Roberts, CC, and Abdel-Rahman, SM (2006). Mucosal eosinophilia and response to H1/H2 antagonist and cromolyn therapy in pediatric dyspepsia. Clin Pediatr (Phila). 45, 143-147. Molina-Infante, J, Rivas, MD, and Hernandez-Alonso, M (2014). Proton pump inhibitor-responsive oesophageal eosinophilia correlates with downregulation of eotaxin-3 and Th2 cytokines overexpression. Aliment Pharmacol Ther. 40, 955-965. Hondeghem, LM (2013). Domperidone: limited benefits with significant risk for sudden cardiac death. J Cardiovasc Pharmacol. 61, 218-225. Talley, NJ, Tack, J, Ptak, T, Gupta, R, and Giguère, M (2008). Itopride in functional dyspepsia: results of two phase III multicentre, randomised, double-blind, placebo-controlled trials. Gut. 57, 740-746. Holtmann, G, Talley, NJ, Liebregts, T, Adam, B, and Parow, C (2006). A placebo-controlled trial of itopride in functional dyspepsia. N Engl J Med. 354, 832-840. Amano, T, Ariga, H, and Kurematsu, A (2015). Effect of 5-hydroxytryptamine receptor 4 agonist mosapride on human gastric accommodation. Neurogastroenterol Motil. 27, 1303-1309. Bang, CS, Kim, JH, and Baik, GH (2015). Mosapride treatment for functional dyspepsia: a meta-analysis. J Gastroenterol Hepatol. 30, 28-42. Xiao, G, Xie, X, Fan, J, Deng, J, Tan, S, Zhu, Y, Guo, Q, and Wan, C (2014). Efficacy and safety of acotiamide for the treatment of functional dyspepsia: systematic review and meta-analysis. ScientificWorld-Journal. 2014, 541950. Talley, NJ, Locke, GR, and Saito, YA (2015). Effect of amitriptyline and escitalopram on functional dyspepsia: a multicenter, randomized controlled study. Gastroenterology. 149, 340-349.e2. Ford, AC, Luthra, P, Tack, J, Boeckxstaens, GE, Moayyedi, P, and Talley, NJ (). Efficacy of psychotropic drugs in functional dyspepsia: systematic review and meta-analysis. Gut. Tack, J, Ly, HG, and Carbone, F (2016). Efficacy of mirtazapine in patients with functional dyspepsia and weight loss. Clin Gastroenterol Hepatol. 14, 385-392.e4. Friesen, CA, Kearns, GL, Andre, L, Neustrom, M, Roberts, CC, and Abdel-Rahman, SM (2004). Clinical efficacy and pharmacokinetics of montelukast in dyspeptic children with duodenal eosinophilia. J Pediatr Gastroenterol Nutr. 38, 343-351. Pilichiewicz, AN, Horowitz, M, and Russo, A (2007). Effects of Iberogast on proximal gastric volume, antropyloroduodenal motility and gastric emptying in healthy men. Am J Gastroenterol. 102, 1276-1283. Holtmann, G, and Talley, NJ (2015). Herbal medicines for the treatment of functional and inflammatory bowel disorders. Clin Gastroenterol Hepatol. 13, 422-432. Kim, KN, Chung, SY, and Cho, SH (2015). Efficacy of acupuncture treatment for functional dyspepsia: a systematic review and meta-analysis. Complement Ther Med. 23, 759-766. Haag, S, Senf, W, and Tagay, S (2007). Is there a benefit from intensified medical and psychological interventions in patients with functional dyspepsia not responding to conventional therapy?. Aliment Pharmacol Ther. 25, 973-986. Ford, AC, Forman, D, Bailey, AG, Axon, AT, and Moayyedi, P (2012). Effect of dyspepsia on survival: a longitudinal 10-year follow-up study. Am J Gastroenterol. 107, 912-921.